The strong geometry of Victor’s boldly tapered chevron-shaped body, clad in striking panels of brushed stainless steel and rich walnut veneer, all converge to create a modern sophisticated dining environment. 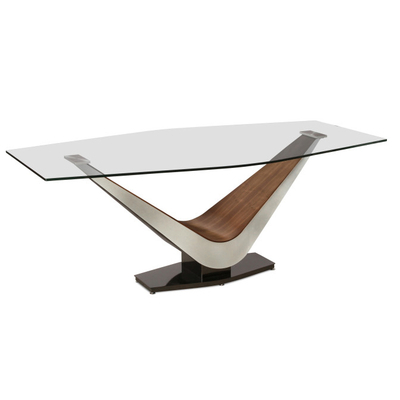 A generous reverse hourglass-shaped glass top further reinforces Victor’s refined geometrical presence. Two solid stainless-steel billets securely anchor the 1/2” thick tempered glass top. 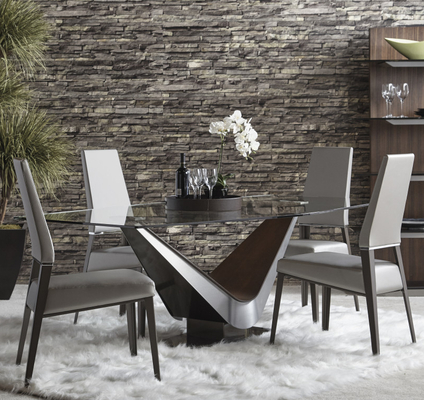 Victor will easily coordinate with and complement any of our popular dining chairs. Companion cocktail table, end table, and console, are also available. Available in multiple powder-coat finishes.